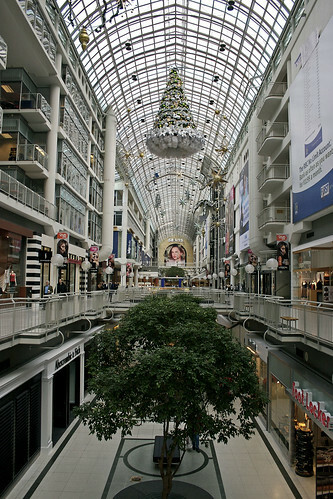 Eaton Centre, originally uploaded by denmar. I shot this with my girlfriend while I was at the Eaton Centre the other day. They just put up the Christmas stuff, right on November 1st. They did it really quick. This was shot right beside the Apple store. Blogger has been giving me problems, I think it might have to do with the configuration or something so I'm going to look into it so I can update regularly. I might be shooting for Ryerson's Inpendent Newspaper, the Eyeopener, so we'll see what happens with that. Anyways, take care.